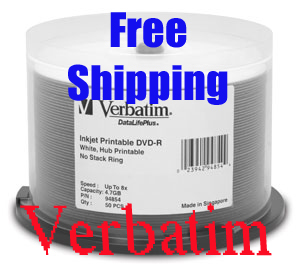 An Authentic Verbatim Product -- Combining an exception inkjet hub-printable surface with professional grade, Metal Azo, recording performance and reliability, Verbatim DataLifePlus White Inkjet Hub Printable DVD-R 8x discs are the ultimate choice for developing, customizing, and distributing DVD content. 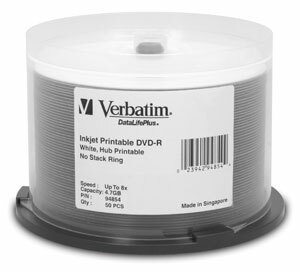 Certified for 1x-8x DVD recording and preferred by DVD-R drive manufacturers, Verbatim DataLifePlus DVD-R media uses an advanced "Metal Azo" recording dye to provide the highest level or performance, compatibility, and archival life. 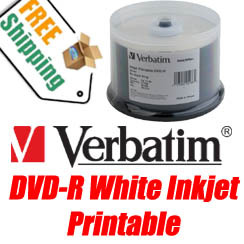 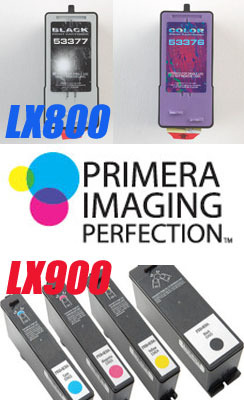 DataLifePlus White Inkjet Hub Printable 8x DVD-R discs have been extensively tested and qualified for use with DVD/CD Inkjet printers and duplicators offered by such leading industry manufacturers as Primera, Microboards & Epson.